Pocket has established itself as the ultimate read-it-later service Pocket - The Ultimate Digital Bookmarking Service Pocket - The Ultimate Digital Bookmarking Service As Bakari previously reported, the well loved Read It Later - which enabled users to save articles to read later from a bookmarklet or various apps it was integrated with - was discontinued and replaced... Read More and for good reason. The service is packed with hidden features 9 Ways to Get More Out of Pocket 9 Ways to Get More Out of Pocket Pocket is the ultimate digital bookmarking service out there. Let's find out how to boost your Pocket experience with the right web apps and extensions. Read More , and connecting Pocket to automation service IFTTT Supercharge Your Pocket Experience With These IFTTT Recipes Supercharge Your Pocket Experience With These IFTTT Recipes Between the two of them, Pocket and IFTTT are excellent services that do their part in making their users more productive. 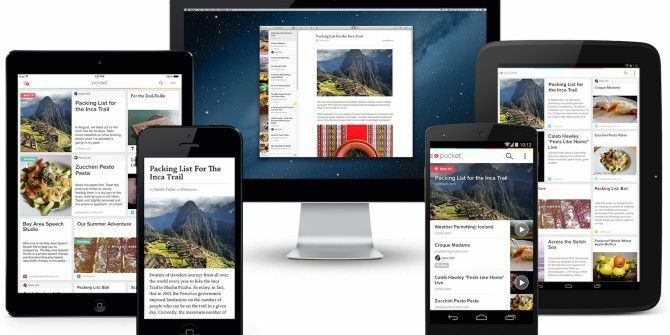 Pocket gives users a one-stop shop to access all of the content - articles,... Read More makes it even more powerful. One way you can get even more out of Pocket is to share your reading list with others. There are two ways you can share your pocketed stories with other users. The first method is a native Pocket feature in which you can selectively share recommended reads with your contacts. The catch is that you can only do this from the iOS or Android apps. To do this, open up the story you want to add to your Recommended List and tap the icon with the heart inside a speech bubble. When adding the story to your Recommended List, you can also automatically share that recommendation on Twitter and Facebook. Anyone who follows you on Pocket will view your recommendations in their Recommended Feed. Your list is viewable at https://getpocket.com/@USERNAME. From there, you can also delete stories that you’ve added to your recommendations. If you want to share your entire list publicly, regardless of whether they follow you on Pocket or not, you’ll have to rely on a third party service. By connecting your Pocket account to SharedList [No Longer Available], you can easily share either your entire Pocket reading list, your favorites, or stories with a specific tag. You can also choose to hide your unread list if you so choose. After you connect to SharedList, go to the settings to choose what you want to share. Once you’ve connected your account, you should be able to share a personalized URL with anyone you choose, and can also share an RSS feed with others. Your public feed will also be available to other SharedList users. If you decide you no longer want to share your reading list with the public, you can unshare your list from the same settings page. How do you share your Pocket reading list? Let us know in the comments. Hi, do you know why SharedList is no longer available? Is there any other way of achieving the same goal of sharing a list?